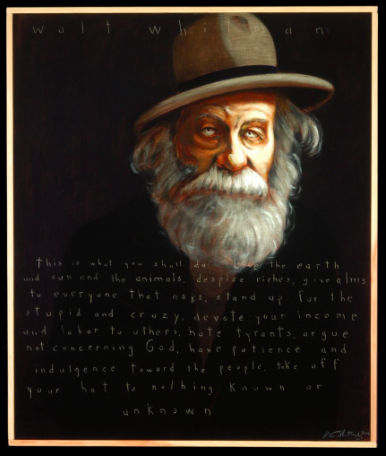 Article about Robert Shetterly and Americans Who Tell the Truth paintings in the Maine Sunday Telegram, December 9. Having followed Rob’s work for quite awhile it is so interesting to read this interview with Rob about his paintings. 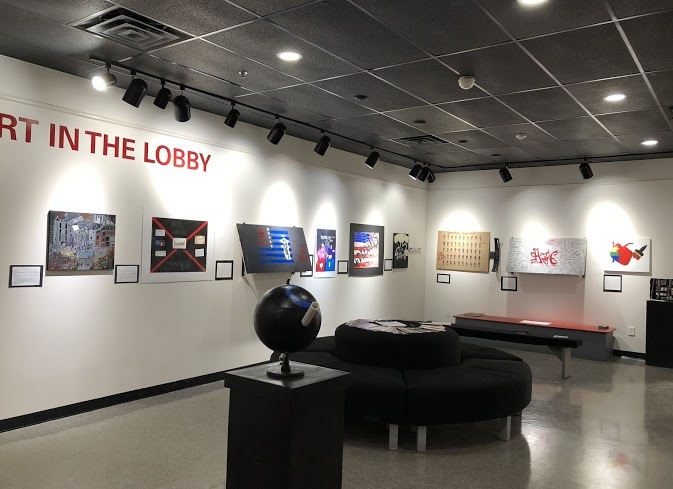 As I’ve included in recent blog posts about Rob’s work the article includes information and the interview about the exhibit at Syracuse University. 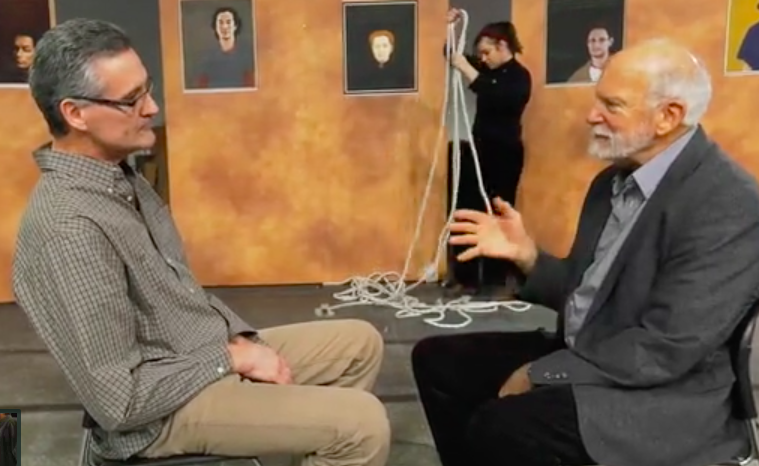 “For the first time, all 238 paintings in Maine artist Robert Shetterly’s “Americans Who Tell the Truth” portrait series are on view together at Syracuse University in New York. Shetterly, who lives in Brooksville, began painting portraits of courageous Americans 17 years ago as an act of defiance against the war in Iraq.” For the entire article written by Bob Keyes, CLICK HERE. I have been a middle school teacher for 13 years, and I can honestly say that the Samantha Smith Challenge, (SSC) which my students and I participated in last year, provided some of the most important and exciting learning we have ever had in my class. 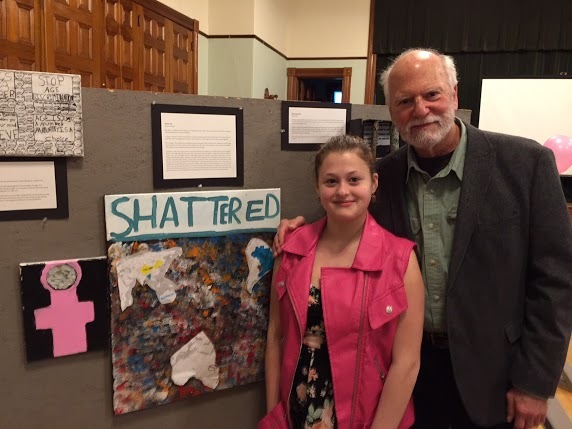 SSC is a program of Americans Who Tell the Truth (AWTT) established by artist Robert Shetterly. Many of the 70 students I taught in my 8th grade social studies class last year were not academically motivated and struggled just to complete assignments. Many of them required considerable support, and had completely lost interest in school. 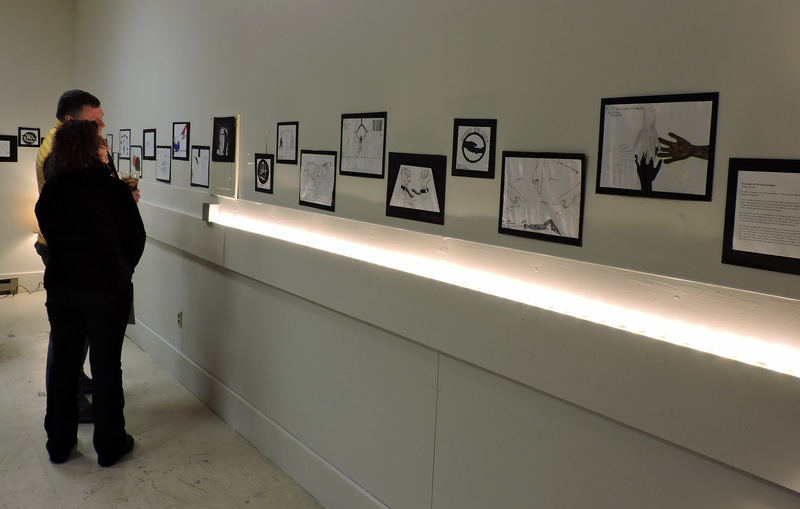 However, I noticed those who had become apathetic were constantly drawing during my class and I realized that art might be a motivator for my students. 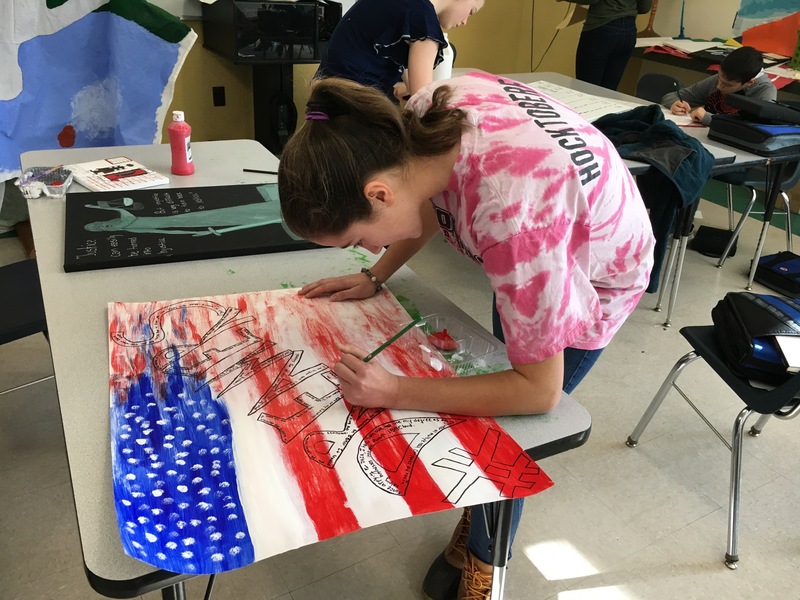 At that time, I had no idea that bringing the arts into my social studies classes would dramatically improve my students’ knowledge, their confidence, and their ability to empathize with people in situations much different than their own. And perhaps it is this empathy borne out of their art that helps them to better understand the true meaning of social justice. Together the students and I studied the United Nations document, The Universal Declaration of Human Rights as our anchor text. After they developed an in depth understanding of the 30 basic human rights outlined by the document, they chose the one that was most meaningful to them. Each student was charged with researching current events around the world, to see if the human right which they chose was being denied anyone, or any groups of people around the world. They focused in on this particular event, and learned as much about it as possible. It was interesting to me how much the information they discovered shocked them. Many of them had no idea about the extent of these injustices. 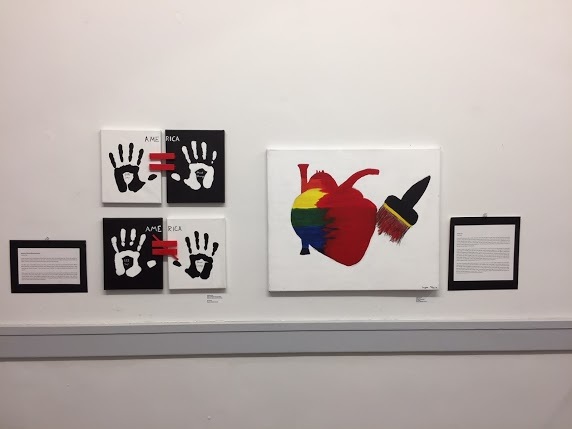 After my students showed a full understanding of the injustice, they designed and created works of art, and wrote artist statements, based on their understanding of the denial of this human right. We titled our project You Be The Judge: Justice Through Art. 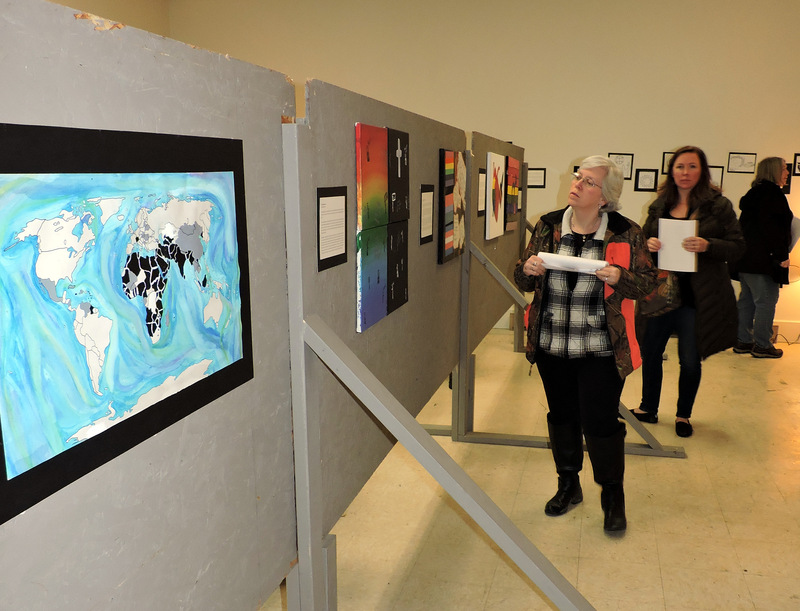 Our mission statement, the art work, news and images of the students’ work in gallery displays, and our thank-yous can be viewed on the website the students and I created after we finished the project. this authentic audience, along with their commitment to the issues they researched, helped them create and participate in quality work throughout the project. We all worked extremely hard to complete pieces, edit artist statements, hang the gallery display, and show the work. What was so different about this project was that the students were no longer struggling with motivation. They saw the importance in what they were doing. They understood that they could teach their fellow community members. 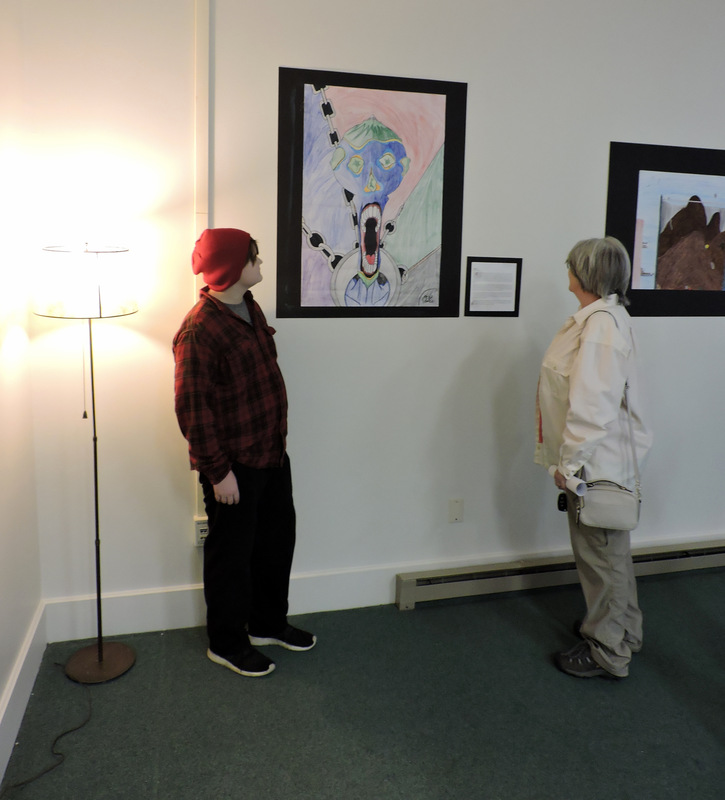 Their work reached beyond the local gallery we created with showings at the Universalist Meeting House in Pittsfield, Waterfall Arts “Young Artists’ Gallery Takeover” exhibition in Belfast, and Art in the Lobby at Railroad Square Cinema in Waterville. Along the way, as we were in the thick of the rigorous work it takes to pull off a project like this, it was connections to the real world outside the classroom walls that kept us going. 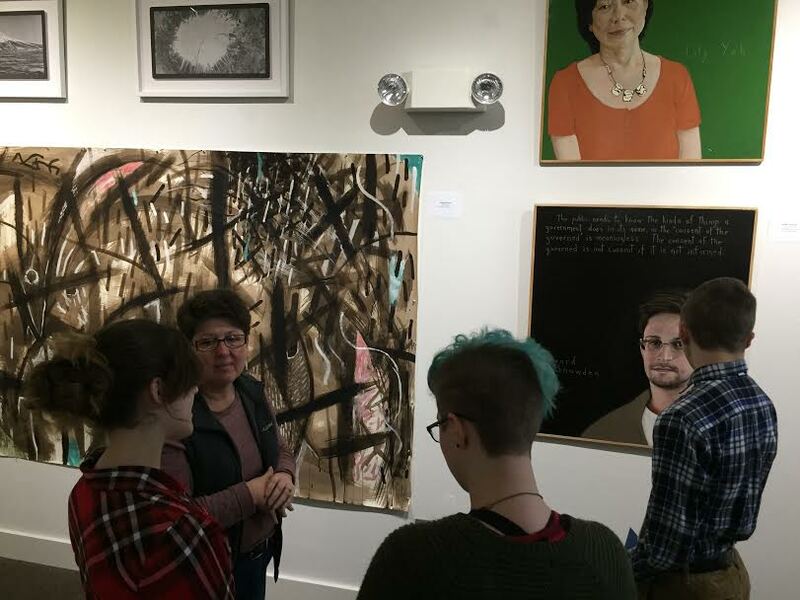 We were able to visit the Holocaust and Human Rights Center in Augusta that, at the time, had an amazing exhibit called America Now… A Dialogue. 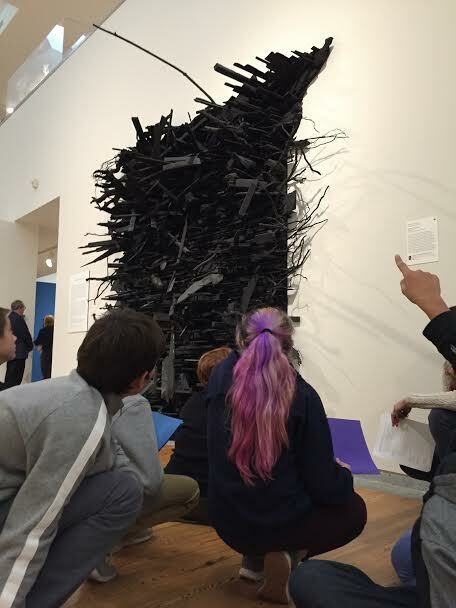 We also visited the Portland Museum of Art where students participated in case studies to look into other works of art connected to social justice. 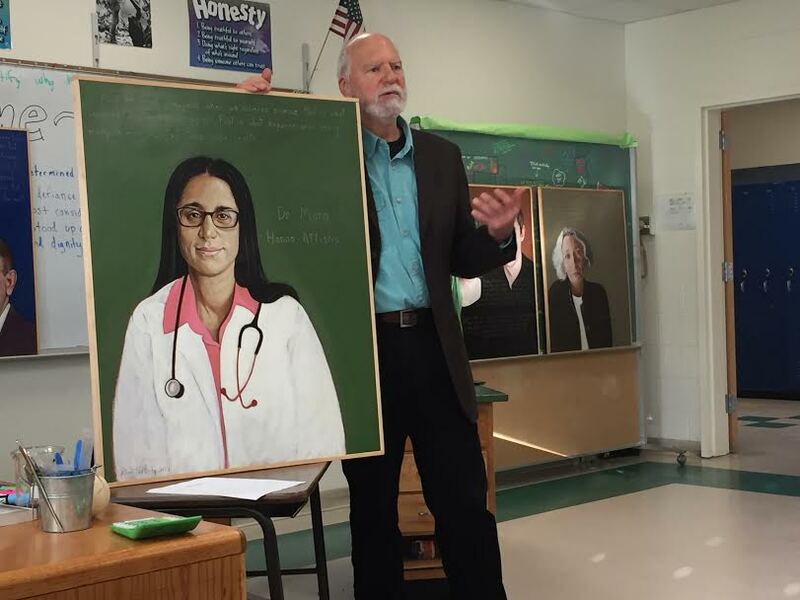 As a part of participating in the Samantha Smith Challenge, artist Robert Shetterly visited our school. His talks inspired many students to dive deeper into the current events they found. 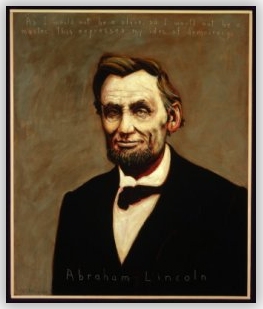 He challenged them to look at situations from multiple perspectives and he helped make connections between my students and some of the “courageous citizens” he painted. These experts shared their first hand knowledge with my students. It was so powerful for the kids to hear from people who work on the front lines of the issues they had become so passionate about. Before we started the project I identified the district standard we would be addressing throughout, “researching, selecting, and presenting a position on a current social studies issue by proposing and revising research questions, and locating and selecting information from multiple and varied sources.” I used our district learning targets, to create a rubric for assessment. In order to meet standards, students had to do the following: 1. Summarize and interpret information found in varied sources and from fieldwork, experts, and interviews. 2. Distinguish between primary and secondary sources. 3. Evaluate and verify the credibility of the information found in print and non-print sources. 4. Make individual and collaborative decisions on matters related to social studies using relevant information and research and discussion skills. Of course, along the way we participated in mini-lessons geared towards each part of these learning targets as well. After completion of the entire project, I sat down one weekend to assess their work using the rubric I had created at the beginning. When I came back to school on Monday, I told the students how fun and exciting it was to assess their work. Authentic, real-world application of their knowledge had earned nearly all them 4s or “exceeds standards” on their work. I told them I felt like Oprah doling out 4s instead of cars, “You get a 4, and you get a 4, and you get a 4!” Although, as I write this, I realize how ironic the term “exceeds standards” is. It was always my expectation that students would apply their new found knowledge in a real world situation; that was the whole point of the project. If we set our expectations high, students will rise to meet them, and then we can all be proud of the work we accomplish. Perhaps one of the most difficult, yet important parts of teaching is finding a way to inspire students to rise to those expectations. 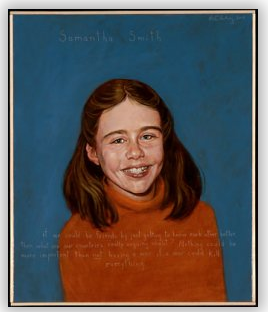 The Samantha Smith Challenge helped provide that inspiration for my students. Interested in learning more about Americans Who Tell the Truth and Operation Breaking Stereotypes? Americans Who Tell the Truth, Operation Breaking Stereotypes and Waterfall Arts invite you to a free professional development workshop, “Inspiring Citizenship and Student Performance”. The workshop will be held at Waterfall Arts, Belfast, Thursday, October 18, 3:30 – 7 pm for K-12 educators. This is an opportunity to frame your course content in a meaningful real world context as you guide your students to become informed, courageous citizens. A selection of Rob Shetterly’s Americans Who Tell the Truth (AWTT) portraits are on exhibit at Waterfall Arts through October 31. 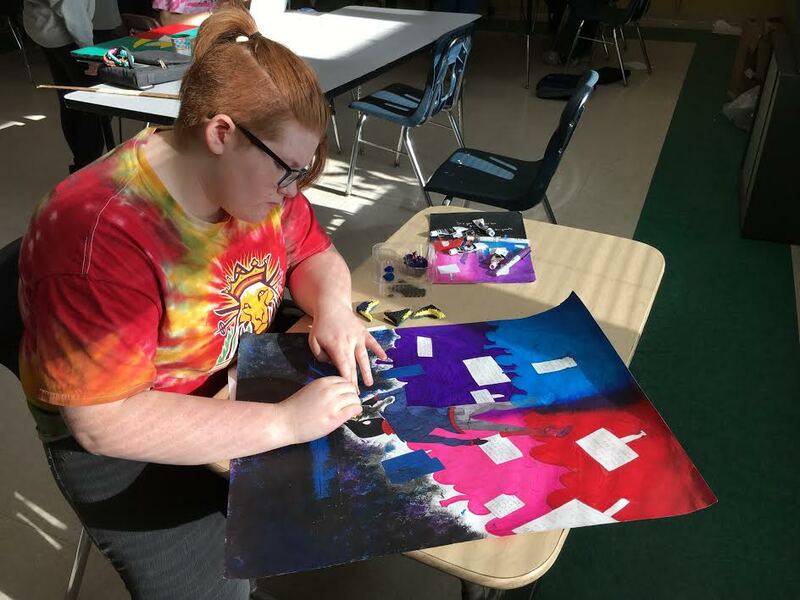 Apart from being inspiring and stimulating paintings, they have, over the past decade, proven to be accessible and effective classroom tools, especially in the visual and performing arts, social studies, history, and English/language arts disciplines. Be part of a presentation and conversation about how AWTT materials have and can be employed in classrooms to increase student interest and performance. 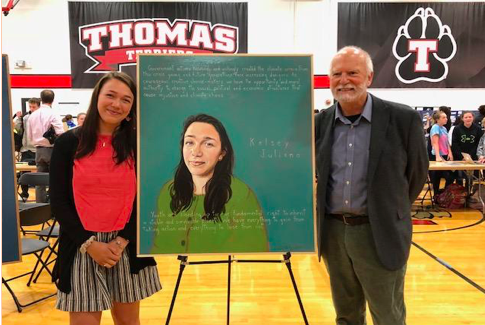 In Louisville, Kentucky, where the portraits have been a part of public school curricula for four years, students have demonstrated improved attendance, retention and performance. This workshop will acquaint you with AWTT, its educational resources, connections to content and standards, and ways to use this material in your school and classroom. 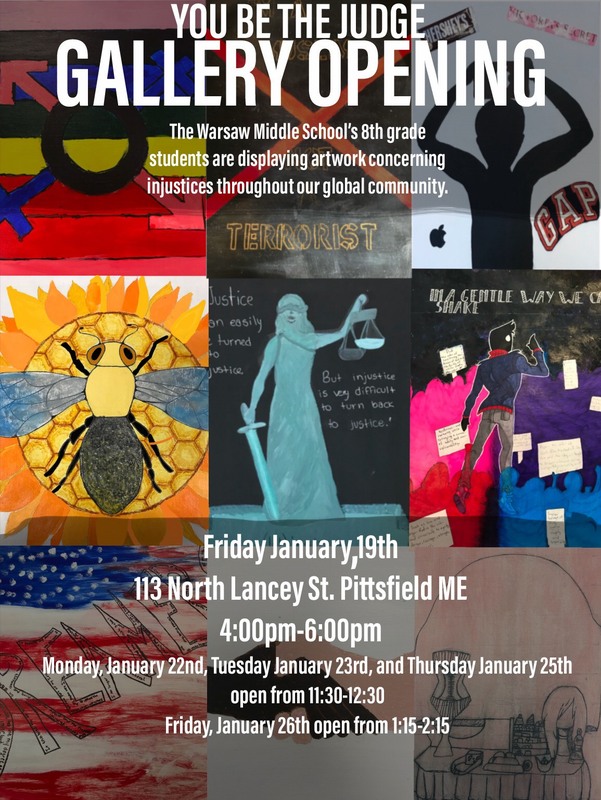 Presenters include AWTT founder, Rob Shetterly, AWTT portrait subject Florence Reed and Karen MacDonald of the King Middle School in Portland, Maine. If you are interested in attending click here for registration. If you have questions please contact Connie Carter at conniecarter21@gmail.com. The space is limited to the first 40 educators. Suggest this to other teachers in your building or district and consider attending as a team – administrator, content area teachers, students – whatever you feel constitutes a “team” at your school!